We have vast experience in all components of Golf Course construction. 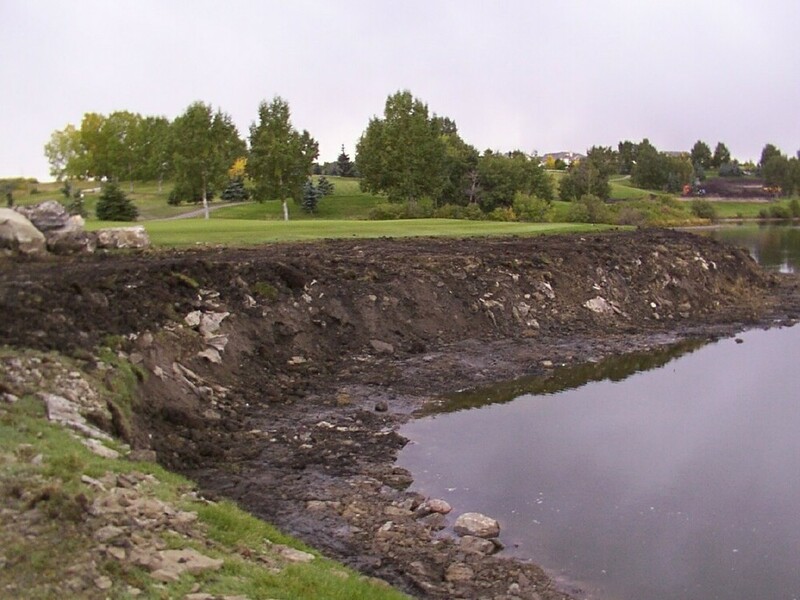 From small tee restorations, to complete hole reconstruction, we have the knowledge to tackle any course construction issues with a special emphasis on water feature drainage and environmental-related projects. Management has had the benefit of working on a variety of redesign and major construction projects at this location since the mid 1970’s. In recent years, the focus has been on the reconstruction of tee boxes, addressing environmental and erosion issues related to Nose Creek, and restoring the southern constructed irrigation pond and fairway edge (12thhole). Logistical planning and alternate strategies were required to deal with unpredictable weather conditions in early spring and late fall to ensure not to impact the normal playing season. Applications for permits with Alberta Environment and Federal Fisheries added to the challenge. Many of the tee boxes and some green edges were originally built using rail road ties. Once a suitable structural rock was selected, the ties were removed and replaced. Some redesign was implemented to accentuate the new facades including stone stairs. Nose Creek with increasing development up stream has been subject to major flooding causing considerable erosion to tee boxes. Finding the right environmental solution and protecting the future of the golf course took considerable involvement of numerous interests. The 12th hole irrigation pond had filled with silt over the past 40 years and the fairway edge had developed stability problems. 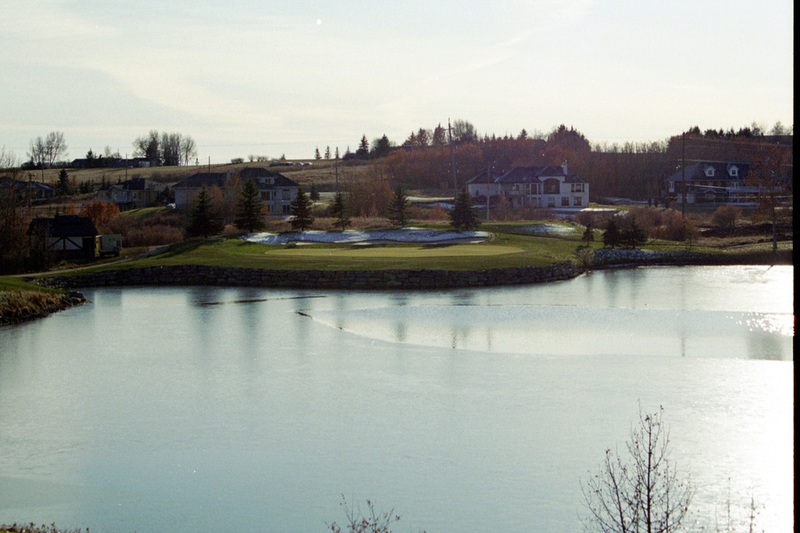 The solution for the pond was to excavate the silt to the original bottom in the middle of the winter, add a new rock edge to the shoreline and improve the playing surface along the fairway to the green. A modern aeration system and bubblers were added to reduce algae growth and promote improved water quality for the irrigation system. SCOPE Projects were asked to examine the existing fairway conditions of the fairway on the 15th hole for the Carnmoney Golf Course in the winter of 2002. 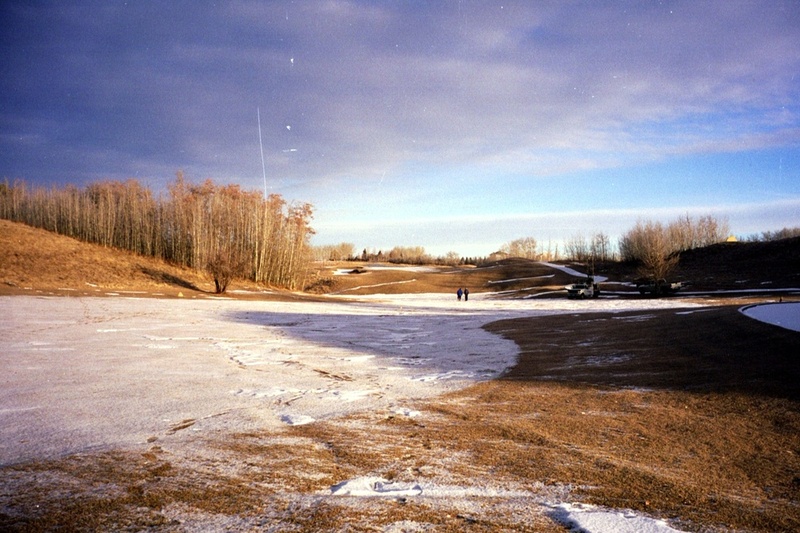 The hole suffered from extremely uneven and unplayable fairway conditions, despite being rebuilt by other companies numerous times. The existing drainage system was completely under-performing, to the extent that pipes were coming out of the ground, and the fairway was frequently soggy and saturated with moisture. Armed with their knowledge of soils and with some historical data, the soil conditions were thoroughly analyzed visually and scientifically by sampling a small number of small test holes. With the findings, new design recommendations were provided soon thereafter. In those recommendations were a combination of two new drainage systems and soil amendments, which were successfully implemented by SCOPE Projects later in the fall of 2003. The hole has completely dried up, and the drainage system continues to perform well, even in heavy rainfall scenarios. The finished photos are from the summer of 2004. SCOPE has been retained on a number projects throughout the Bearspaw Golf and Country Club. In most instances the work conditions are focused to early spring or late fall creating drastic weather conditions and unique construction challenges. The unique soil conditions and high water table in the Bearspaw area make many projects as much about logistics as the design itself. Most recently SCOPE redeveloped the 18th green area rebuilding a new retaining wall along the front of the green while making sure not to disturb the actual green structure itself. This process involved a complex assembly line of machinery to ensure the least amount of disturbed area and very tight working conditions. With a strong push before the deep cold of winter we were able to complete the project ahead of our estimated timeline and create a wall feature that has enhanced the overall appeal of a very scenic golf hole. In recent past we have also been involved in projects including rebuilding the putting green, multiple new tee decks, many retaining wall features and a variety of drainage enhancement projects.